It has been a long time coming but finally, Ireland has a proper Double IPA and one that we could proudly export to the US and not get made fun of. I went to Connemara to go scuba diving this weekend. I left my instructors house about 9 after doing a theory session, went home and got my campervan to drive to Galway. My plan was to stop off in Salthill and spend the night there, try Of Foam And Fury and then head to Connemara in the morning. I dropped in to The Oslo, home of the Galway Bay Brewery to try it on the launch night. I bought my beer and sat down to take notes and drink it. I noticed that they are having a tweeting review competition. The winner gets their review on the bottled version with your face, or a cartoon version of your face. So I wrote the following. 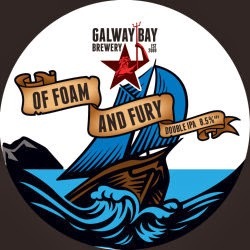 To expand on that somewhat, Of Foam And Fury is an 8.5% cacophony of contrasts. A tropical fruit bouquet with plenty of caramel, citrus and pine needle. On tasting, I was first hit by the big chewy body which resolved in to a big sweet caramel hit. Almost instantly later a massive bitter orange pithiness came through before being replaced by various tropical fruits. It varied from very bitter one moment to very sweet the next, this even followed through to the finish. A minute after swallowing my mouth was still alternating between the bitterness and the sweetness with the citrus and tropical fruits having a party in between. When I noticed that my beer was nearly all gone, I realised that it's a dangerously drinkable beer. Those were my notes up to that point. What happened after that was totally unexpected. Jason, one of the owners of the group had been following my tweets and called up the Oslo and basically told them to take care of me because next thing I knew I had a bowl of spicy nut mix in front of me and the offer of a free pint. 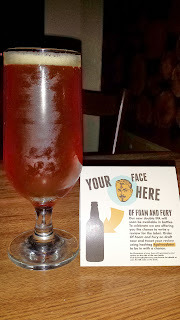 There was clearly only one beer I wanted at this point so I sat down to another DIPA. At his point I should say that the beer is not available by the pint. It's served in a two thirds of a pint measure but will cost the price of a pint or more due to the immense quantities of ingredients that must go in to it, especially the hops. I was then offered a tour of the brewery, by tour I mean shown around because Chris the brewer wasn't there so they didn't really know what was what but I took a full look and it was impressive, especially considering how small the old one was. On the way back to my seat I was told about their other specials. One was the imperial brown which I knew about but hadn't had and the other was a Chilli Pumpkin beer I didn't know about. A sample tray with one of each as well as Buried At Sea was dropped over to me. I took the burred at sea off the tray. 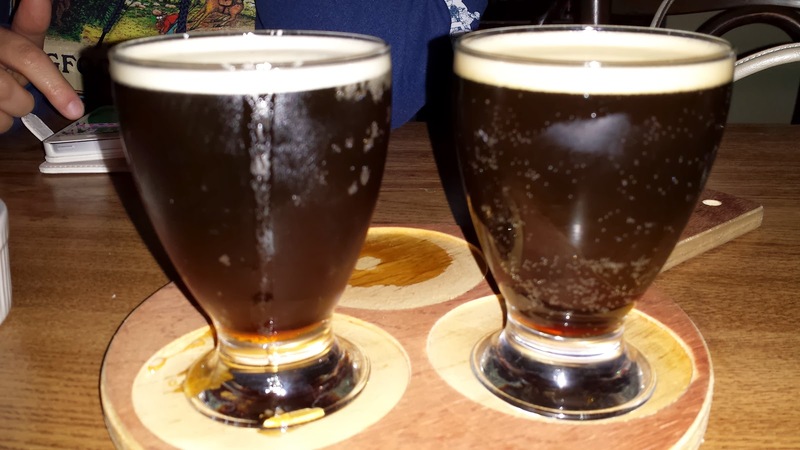 The other two beers actually look identical but are nothing alike. On the left is the Chilli Pumpkin Ale and that means the Imperial Brown is on the right. The Chilli Pumpkin had almost no aroma and doesn't taste of too much either, by that I simply mean that it doesn't taste much of pumpkin. There was the barest hint of spice but to be honest, it could have simply been from the spicy nut mix I was wolfing down earlier. I suspect this might be based on the Bay Ale recipe with some extras thrown in. The Imperial Brown was lovely in comparison, packed full of rich chocolate, some interesting hops that I couldn't pick out as they were hidden by the chocolate. It was smooth and creamy, like a good hot chocolate in some ways. More of this please.